Players should only have to concentrate on the game only when they are plying it. Exosuit is designed to maximize performance and also protect the players from intense movement and friction. Exosuit carefully selects the finest and most rugged material to protect players and provide long-lasting durability. Launching first with a line of baseball pants, Exosuit will expand from there to capture the team market with looks and styles for sports such as football, soccer and volleyball. There’s nothing better than an outfit that’s both comfortable and stylish. Tube provides women’s clothing that is effortlessly attractive and flexible, designed for wear at work and any casual occasion, too. Starting with its pants line, Tube will expand to skirts, tops and dresses. While wearing garments and accessories, have you ever worried if animals were killed for your own beauty? 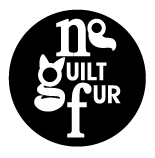 No Guilt Fur is made from 100% synthetic faux furs expertly selected by Bylon Ltd.
Nowadays, cutting-edge fiber technology makes faux fur look and feel just like the real thing. Be fashionable and show your love for animals at the same time.